BrightHaven > Blog > Events > Fundraising > The BrightHaven Animals Know All About Love! 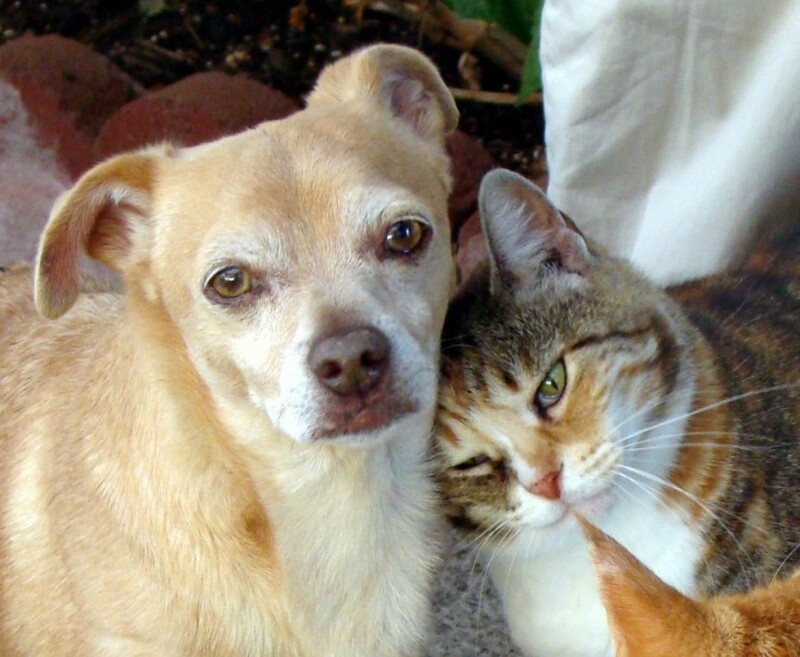 This photo of cherished BrightHaven legends Joey (left) and Sammi truly radiates unconditional love. At BrightHaven, we believe that love is such an essential, transformative and powerful healing force, we celebrate it each and every day! 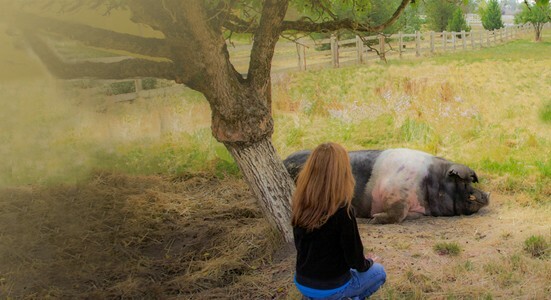 The unquestionable understanding of the importance of love to living a full life is but one example of the deep wisdom shared with us by our beloved animal teachers over the years. To underscore the fundamental role love plays in everyday BrightHaven life, love appears twice on our Menu for Healing, which is an integral part of BrightHaven’s unique approach to living well through the last breath. In honor of love and the Valentine’s Day holiday on February 14th, we’re proud to share the stories of a few of the many BrightHaven animals who embodied love every day in every way. came to us all the way from Long Island, New York. Due to an unfortunate car accident years ago, Joey was left with only a small fraction of the use of his hind end, unable to walk and in desperate need of a new home. As each BrightHaven animal is fortunate to have a volunteer classical veterinary homeopath, when Joey arrived, the renowned Dr. Jeff Levy stepped forward to become his vet for life. During Joey’s time at BrightHaven, there was never any doubt about where he could be found–one only need to seek out Gail and look down, for it seems that Joey had surgically attached himself to her feet and definitely to her heart. Joey loved life and was always one happy camper, whizzing around in his wheel chair, protecting his woman Gail and the BrightHaven property from potential intruders while keeping everybody else in line. His charisma made him everybody’s favorite! Rosie came to live at BrightHaven in 2011 as her health had started to decline. She quickly settled into daily life and showed her motherliness as she gravitated immediately to those in need of love and care, most especially those in the last stages of life. Many of you will have seen our adorable nurse and Anam Cara sleeping with, gently grooming and cuddling countless cats and dogs in their dying processes. 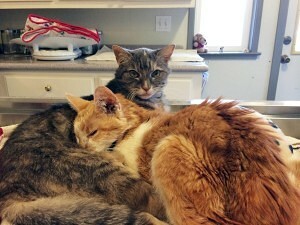 Classical veterinary homeopath Dr. Jeff Levy supported Rosie as she calmly accepted and ignored her severe renal disease and hyperthyroidism and, against all odds she survived and maintained her matronly figure well. At 20 years of age and with long-term chronic illness, dear Rosie prepared to leave this world in November 2015. Her eath was one of the very most peaceful and tender passings Gail has been privileged to accompany. before his arrival at BrightHaven, much to our surprise within a year Harley weighed 700 pounds! Unfortunately, eventually he was too heavy for his back end and so four years before his death he sat down and never got up. So just like animals do, he uncomplainingly dealt with it–he scooted around–and ate well, grunted happily and enjoyed life. When Harley went down experts told us that he could not survive, but three years later he was still scooting around–and still finding happiness in every day. He had regular appointments with his classical veterinary homeopath Dr. Laurie Lofton and regular visits from our large animal vet Dr. Tere Crocker. None of our staff or vets ever recommended euthanizing him. 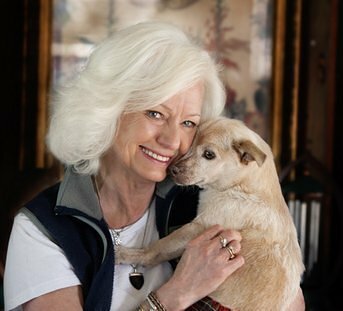 Harley’s nickname over the years became “the Reiki hog” as he reveled in sessions with Kathleen Prasad’s animal Reiki workshop participants, most of whom mistakenly believed they would help him with his pain and suffering. They would return later with tears streaming after experiencing the depth of his gentle and kind compassion. One July on a warm summer’s day, 14-year-old Harley lay down and peacefully, quietly and naturally died, with a smile on his face. How Can I Show Love to the BrightHaven Animals? What Makes BrightHaven So Unique?